H-I colored diamonds are great value. 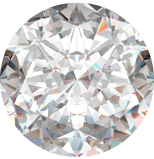 This near colorless diamond can cost up to 50% less than a D colored white diamond. A white gold ring setting will make the color in the stone difficult to see.